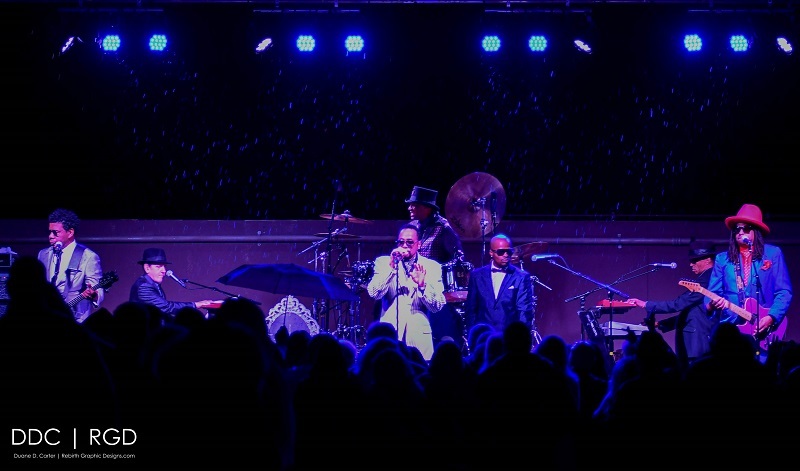 This is my first shoot of the new year with a brand new camera Nikon D500 and I get to cover one of the coolest bands ever to perform, Morris Day and The Time. Performing outdoors at BLK Live in Scottsdale on a rare rainy night for Arizona. They acted like it was a bright sunny day. For those who may not know who they were, they were the rival band of Prince and the revolution in Purple Rain Movie. In reality, Prince put that band together starring Morris Day, Jerome Benton, Jimmy Jam and Terry Lewis Jessie Johnson. They were an All-Star Funk Band in the 80s, their theme was being cool, getting girls and partying hard. Something that they still seem to go by although a little older and with new band members Jellybean Johnson, Monte Moir, Ricky Smith, Torrell Ruffin & Stan Howard.